When I woke up this morning, my hands were freezing. As much as I love the colder times of the year, the cold hands can be hard to work with. I commented to Z that I should make a coffee to warm my hands up, like I used to do in my military days (deity knows it wasn’t fit to drink ¬¬). He suggested boiling water and not wasting good coffee, so instead I decided I was legit going to have a coffee in the morning… yanno, after a couple lots of cold caffeine so my stomach was less bitchy about it. 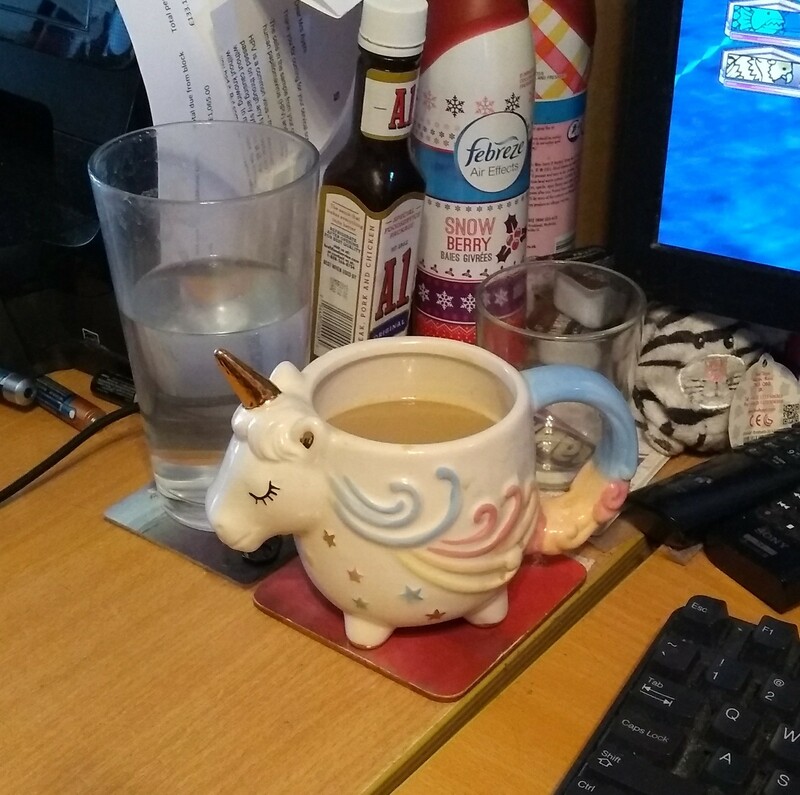 One turned into three across the day, and my unicorn mug there is very generously sized. I wouldn’t be surprised if it was more like having 5 or 6 cups of coffee. At least I’ll probably sleep like the dead for that much caffeine, ha ha. That’s pretty much been it — drinking coffee, and otherwise doing nothing, as befits my day off. Now I’m gonna go back to that, minus the coffee. Dord!